Who will pilot the Starship Enterprise if Chris Pine fails to show up for work on Star Trek 4? That's the question Paramount Pictures is currently facing as the actor has walked away from negotiations for the sequel. And he might not return. Following right behind Pine is his onscreen dad Chris Hemsworth, who also couldn't come to an agreement on his salary for this impending continuation of the sci-fi franchise. Right now, deals with all other returning cast members, including Hemsworth's fellow Marvel co-star Zoe Saldana, along with Simon Pegg, John Cho, Karl Urban and Zachary Quinto, are expected to close. Unless there's some unforeseen mutiny about to arise, in which the entire crew of the Enterprise will need to be recast. It's possible that Chris Hemsworth and Chris Pine are negotiating in public. It seems weird after three movies to bring in a new Captain Kirk while his crew remains the same. Hemsworth and Pine are getting a little to used to making that big superhero money. And that's said to be the main reason for these talks falling apart. Chris Pine has long been expected to reprise his role as Captain James T. Kirk, a character originated by William Shatner. And Chris Hemsworth has been confirmed to return as Kirk's dad George Samuel Kirk, Sr., since even before Star Trek Beyond came out in 2016. This next tale will be a time travel adventure, and is not the Quentin Tarantino Trek installment that we keep hearing so much about. The deal breaker was money. Pine and Hemsworth are considered A-list at this current time in Hollywood. Pine is the male lead in DC's Wonder Woman franchise, second only to Gal Gadot in the cast list. And Hemsworth headlines the Thor series at Marvel, also appearing in spinoffs such as Infinity War and Avengers 4. He's also set to lead the new Men in Black reboot. They are both asking Paramount to stick to existing deals already in place. But Paramount claims Star Trek is not in line with the Marvel movies or something like Star Wars, and they have an actual budget they need to worry about. 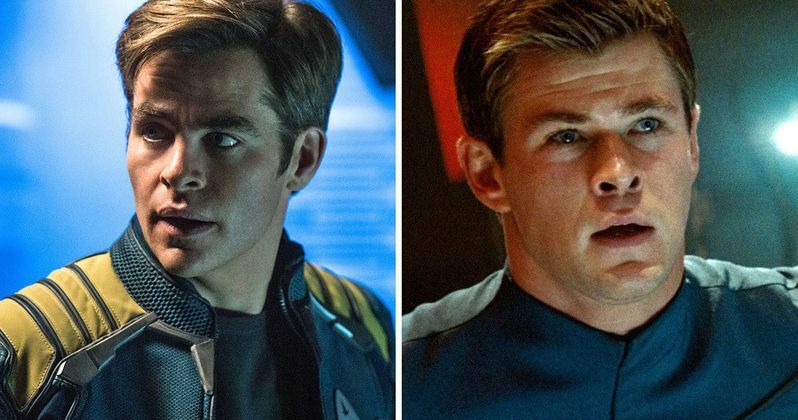 Pine and Hemsworth say that there are already deals in place, and that Paramount and Skydance Media, who produces Trek alongside Paramount, are attempting to ignore those deals. It looks like the two film studios are trying to force the actors to take pay cuts as this next sequel follows Star Trek Beyond, which is being considered a 'mediocre performer' by The Hollywood Reporter. Pine has had his deal locked in place for years. The actor signed for Star Trek 4 even before he shot Star Trek Beyond in 2015. But Paramount doesn't care about that deal, apparently. They care about the overall bottom line. Star Trek 3 only grossed $343 million on a $190 million budget. After factoring all the other costs that come with making and marketing a blockbuster tentpole of summer, Paramount claims it lost quite a bit of money on that last endeavor. J.J. Abrams' 2009 franchise restarter Star Trek turned in $386 million, while 2013's Star Trek Into Darkness is the top earner so far, with $467 million. The Marvel, DC and Star Wars movies all regularly pull in north of $700 million if they don't reach $1 billion worldwide. Looking at all past numbers, Paramount believes that Star Trek has a definite ceiling, and they need to budget accordingly. Right now, Pine and Hemsworth have turned their backs on the franchise. And it's unclear how Paramount will proceed. They could recast Kirk and his dad. If that's not an option, then they'll give into the two actors' wishes and bring them back to the table, probably giving them the salary that they want, or were already owed in their contract. Even if it hurts the bottom line. The movie won't be canceled. It's being called a priority by Paramount insiders. Star Trek 4 will make history as the first-ever installment in the longstanding franchise to be directed by a woman. S.J. Clarkson, perhaps best known for her work on Marvel and Netflix's Jessica Jones, has already secured the job. Paramount proper currently has no comment on this situation.